Wargamer Tom Young has some fine photos of a whole fleet of Trieres in 28mm?scale on his blog 'Tides of War'. 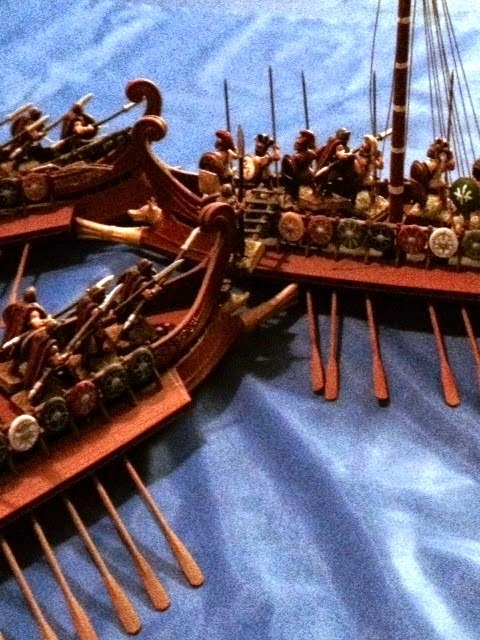 He has done a scenario based on the battle of Notium in 407BC - the one where the orders 'Do nothing' got reinterpreted as 'Here's the fleet, have fun while I'm away'. Nice photos of very nice painted epibatai and a small horde of ships. I recommend a browse around Tom's blog to make you jealous of his painting and scenery. He has a wife and kids and still has time to do all that.....hat off!